There’s an organic restaurant in Ichikawa that is open until 24:00 to welcome the locals after work. 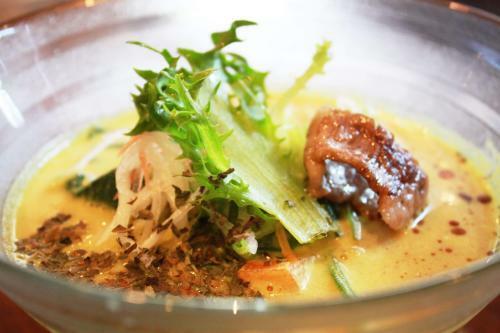 The naturalist restaurant GR8 (to be read Great) is where Yasuhiko Kawahara exercises his culinary skills. The chef has a unique career history as the former owner of Hakata Ippudo, not something you would often hear coming from an organic restaurant. Let’s take a look at the restaurant’s many offerings that display the chef’s passion for food as well as its culinary style, which can only be achieved through the chef’s experience at a well-renowned establishment. Click here for location and detailed information on restaurant GR8. 1 So comforting. 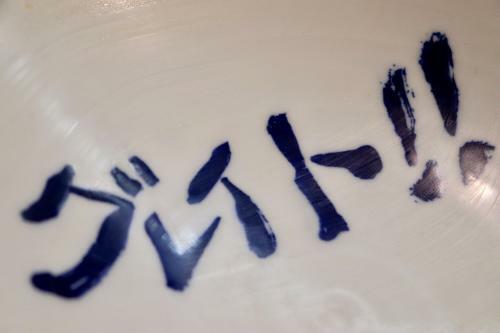 A safe and reliable restaurant to satisfy the stomach and the soul of the local people of Ichikawa. 2 Cuisines using selected vegetables! 4 kinds of vegan ramen. 3 Question the food you’re serving. Aim to provide food that heals the body and has you impressed. So comforting. 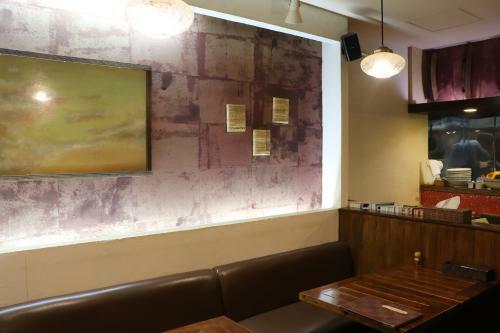 A safe and reliable restaurant to satisfy the stomach and the soul of the local people of Ichikawa. The naturalist restaurant GR8 is located a step and a hop from Chiba’s Ichikawamama Station and 7 minutes on foot from Ichikawa Station. We visited the restaurant at night, and the soft light emanating from the house was welcoming and comforting. It was as if someone was waiting for our return home. With the regular customers enjoying a friendly conversation, the atmosphere made us feel right at home. 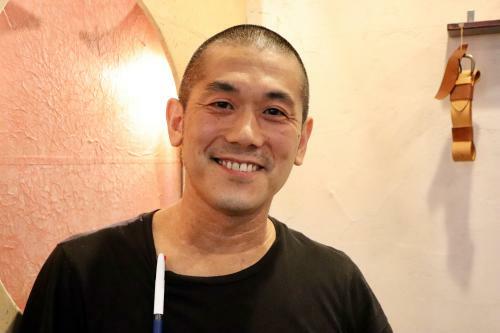 It is Kawahara’s 8th year since opening the restaurant in his hometown of Ichikawa. The mahogany color of the wooden interior exudes a classic ambiance and the soft shades of pink and green give us a pleasant feeling. Cuisines using selected vegetables! 4 kinds of vegan ramen. The naturalist restaurant GR8 offers a menu of mainly locally produced, pesticide-free vegetables and without the use of chemical additives where possible. 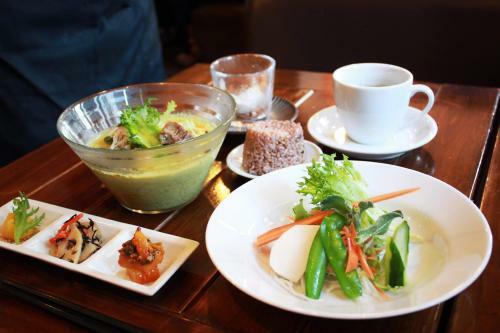 The wide range of menu offerings includes curry, rice bowls, set plates and other dishes which boast the natural flavors of the fresh vegetables. Vegan options are available with most of these offerings. The ramen has to be the most sought-after menu at the restaurant. 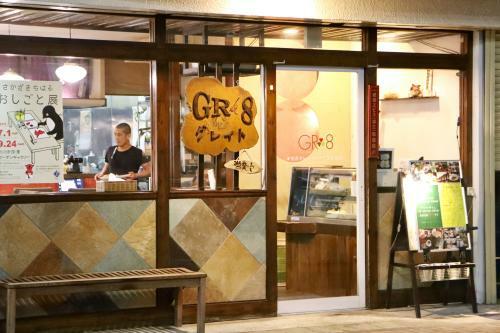 Let’s take a look at the 3 of the 4 types of ramen at GR8. The Hishio GIN Ramen (1,080 yen with tax) features an array of seasonal vegetables; this time, it was topped with a mound of mizuna (Japanese mustard green), zucchini, pumpkin, komatsuna (Japanese mustard spinach), and cabbage. The clear stock is made entirely from vegetables with no animal-based ingredients and accented with ginger. 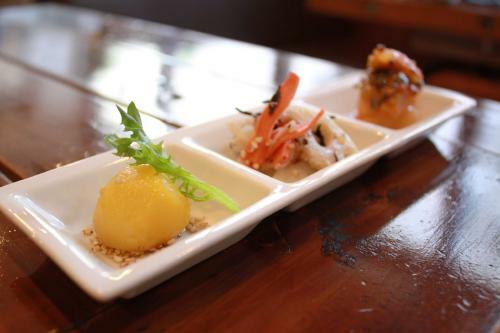 You’ll taste the pure flavor of the vegetables right on your palate with every mouthful. The best thing about a vegan ramen is that you can taste the inherent flavors of the ingredients. 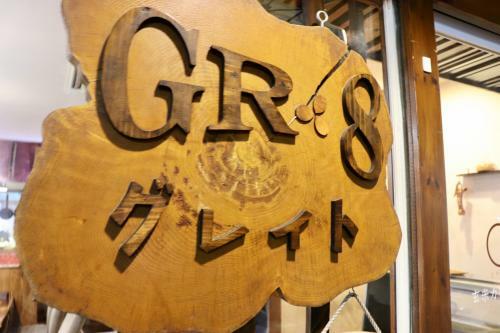 GR8’s noodles are made from its own blend of flour mainly produced in Kagawa and Kumamoto Prefectures. In the noodle-making room on the 2nd floor, different types of noodles are made by adjusting the flour blend according to each type of ramen. The house-made whole wheat noodles have a very unique flavor. 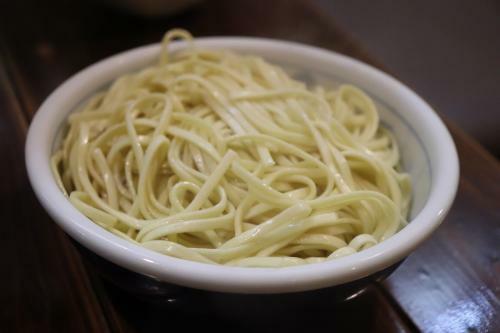 Natural kansui (alkaline solution) is also used in the making of the noodles. 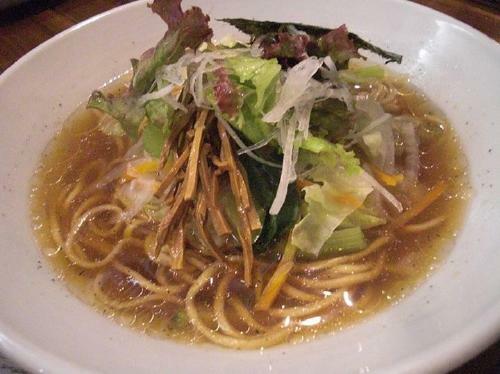 With the kaedama (200 yen), or additional serving of noodles, you can savor the vegetable stock to the last drop! 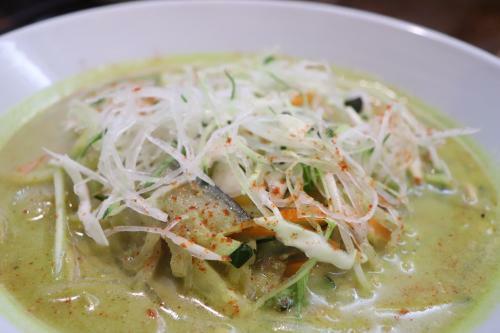 Green Soup Curry Noodles with Seasonal Vegetables (1,180 yen) is made with a blend of mostly organic spices and GR8’s own blend of curry powder. 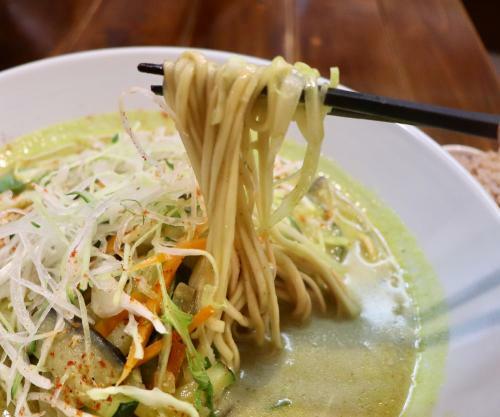 The noodles are made to perfection by decreasing the water content – something that can only be done through in-house noodle processing – in order to give the noodles the chewiness to match with the curry soup. Oils are scarcely used for the soup, which is made mostly with vegetables and coconut milk. The mild-tasting roux is made with tomatoes and soymilk to achieve a creamy thickness. 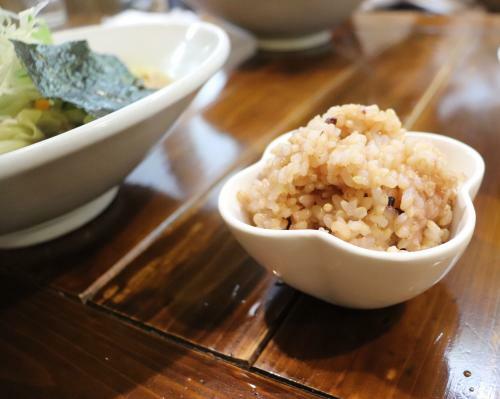 The mini serving of brown rice, a blend of black rice with germinated brown rice, is best enjoyed with the remaining soup to finish off the ramen. 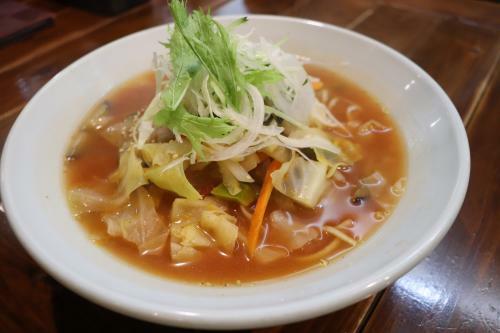 The soup is seasoned with a sweet-flavored soy sauce to bring out the sweet vegetable flavor. The one we had included tomatoes and celery, which are not typically used in ramen. 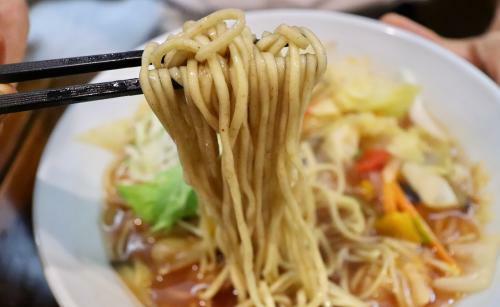 The whole wheat noodles are of medium thickness and have a satisfying glutinous mouthfeel. The fun surprise comes at the end of the meal only to those who have finished the entire ramen – the word “グレイト！！ (GR8!! )” written at the bottom of the bowl. It goes to show that the owner is a kid at heart. Question the food you’re serving. Aim to provide food that heals the body and has you impressed. Kawahara has been in the food service industry for over 20 years including his days at the famous ramen house. What made him open a restaurant with this much attention to the ingredients and health-consciousness? It began when his wife learned the macrobiotic practices. “After three years, I became a believer myself!” says Kawahara (pictured) laughingly. he thought that many of them were too over-priced and had no luck discovering an establishment that he thought was ideal. 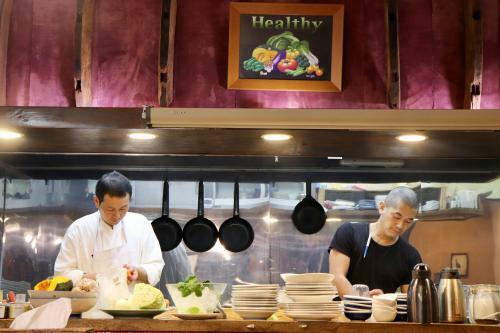 This is when he decided to open his own restaurant in his hometown of Ichikawa in order to provide a cuisine that was palatable and healthy while at the same time being reasonably convenient. Curry and Rice with Pesticide-Free Vegetables (1,080 yen). The way Kawahara is specific about his spices says a lot about his passions. 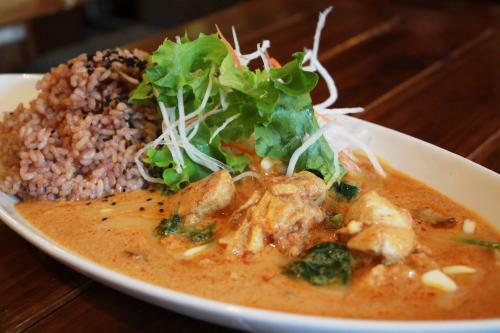 The curry is a means for incorporating spices into the diet to regulate bodily functions. Lunchtime is a great opportunity to enjoy the thoughtfully prepared dishes to the fullest. 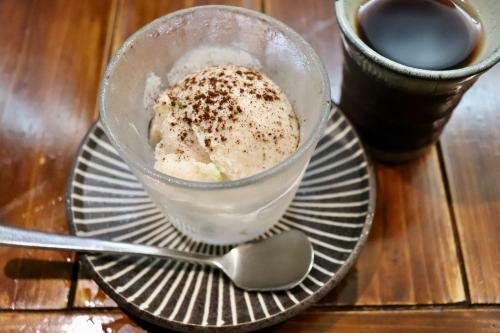 The recommended dessert is the brown rice ice cream handmade in the house. It has an incredibly unique texture that is chewy, jelly-like, and creamy all at once. It is exciting to discover a restaurant that makes it all the worthwhile to go through the trouble to visit.